The Pinhole Surgical Technique™ can effectively treat receding gums without any cutting or stitches! Pinhole periodontal disease surgery is a breakthrough oral procedure used to treat gum recession without the need for grafting, sutures or incisions. This revolutionary technique differs from traditional gum recession treatments, such as connective tissue grafting, which relies on the use of donor tissue or soft tissue grafts to rebuild the gum line. The pinhole surgical technique, on the other hand, uses a small needle to gently loosen the natural gum tissue and slide it over the exposed root structure. This method of tissue adjustment is made possible through the use of special dental instruments that do not require a large incision into the gums — just a small, needle sized hole and some slight gum tissue adjustments. The minimally invasive pinhole surgical technique utilizes a person’s own gum tissue that exists around the site of the gum recession to cover the exposed tooth root. The pinhole surgical technique was developed and patented by Dr. John Chao, D.D.S. and has proven to be a safe and effective way to treat gum recession quickly and naturally. Do not wait to receive treatment for receding gums. 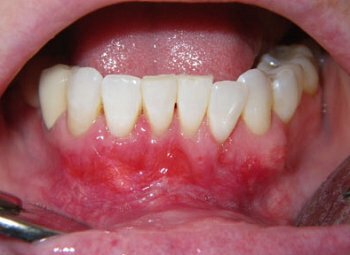 Minimize the disease and damage gingival recession can cause and seek treatment immediately. Call 858.490.4682 to make an appointment today! What are the advantages of the pinhole periodontal disease surgery over other forms of treatment? Traditionally, gum recession is treated by grafting, which involves the patching of one’s gums with connective tissue sourced from a tissue bank or another part of the body, such as from the roof of one’s mouth or surrounding gum tissue. Once it is patched into place, the gum tissue will be stitched up and left to heal naturally over the next couple weeks. Due to the sensitivity and fragility of a connective tissue graft right after it is attached, recovery may take anywhere from one to two weeks. During that time, patients are only permitted to eat soft, cool foods and must be careful when brushing or flossing so as not to disturb the grafted areas. While connective tissue grafting is predictably successful, grafting is not always the optimal cosmetic solution, since the graft tissue may not be an exact color match to the natural gum tissue around the recessed site. Also, postoperative symptoms, including bleeding and pain around the site where the tissue was grafted can be a hindrance to one’s daily life. The pinhole periodontal disease surgery technique, which is available at our San Diego office, can help you achieve more natural-looking results, faster recovery time, and less pain and discomfort after your procedure. Dr. Akef has personally received extensive training and certification to perform the Pinhole Surgical Technique TM from none other than Dr. Chao himself, giving him the expertise needed to complete this revolutionary gum recession treatment for patients safely and effectively. Dr. Akef, a certified periodontist, is one of the few dentists in San Diego who are qualified to perform this procedure. If you suffer from gum recession and want faster, more natural-looking results, contact our office today to see if pinhole recession coverage technique surgery is the right one for you!